Equilibrium stage simulators often attempt to include reaction kinetics by empirical modeling via an adjustable parameter (H2S and CO2 tray efficiencies and/or liquid residence times) that forces the simulation to reproduce a conventionally-operated column's treated gas composition. Some might call this a "rate" model, but it is not a mass transfer rate model - it is an attempt to force a reaction parameter into a model that is inherently unrelated to rate processes in order to match some measure of plant performance. Regardless of any embellishments, equilibrium stage models are nonpredictive. This makes them unable to deal with applications dependent on differences between mass transfer rates of CO2 and H2S for which operating experience is lacking. Furthermore, all equilibrium stage models deal exclusively with ideal stages, with no accurate way to translate into the real world of actual trays and packed bed depths, let alone deal with such questions as the effect of packing type, size and material, or tray type and configuration. In a mass transfer rate model, there are intricate interrelated effects between the five key elements. They respond by a variety of chemical and physical, phase and component transport properties such as (i) chemical kinetics, (ii) diffusion coefficients, solvent viscosity, and other transport properties, (iii) salting-out effects on solubilities, and (iv) the mass transfer characteristics of the actual hardware being used. When a ProTreat® column simulation is run, the tower is being modeled in full detail as a piece of real equipment, not as an idealization. 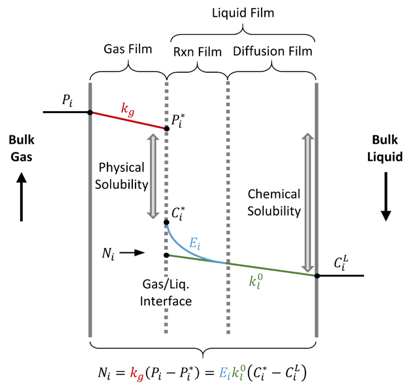 True rate-based mass transfer includes (i) chemical kinetics, (ii) diffusivity, viscosity, and other transport properties for the gas and liquid phases, (iii) salting-out effects on solubilities, and (iv) the mass transfer characteristics of the real, physical hardware. From a separations standpoint, two-pass and single-pass trays perform differently. Metal packing gives different results from plastics and ceramics. In addition, all solvent properties, including the changes in these properties caused by acid gas loading, affect mass transfer coefficients and thereby influence the actual separation that a given column under a given set of operating conditions will achieve. ProTreat's mass transfer rate model is rich in detail and is a faithful mirror of the real world. In the language of process control, a true mass transfer rate simulation uses a distributed parameter model that, consequently is mechanistic, detailed, and fully predictive. This is in contrast to the equilibrium stage approach which is a lumped parameter model - it assigns all the physical and chemical complexities to an efficiency or a liquid residence time) and is accordingly completely nonpredictive.